Christian Fischer’s hat-trick, the first in team history, propelled the Roadrunners to a 5-4 overtime victory over the San Antonio Rampage Friday night at the AT&T Center, cutting the cord on the club’s four-game losing streak in opposing buildings. A fantastic finish in what was the club’s third consecutive overtime affair was executed when Fischer bolted toward a Zbynek Michalek stretch loft pass to bury his third goal of the evening 19 seconds into the extra frame. The night, however, didn’t start off so pleasantly for a Tucson club that was desperate to regain some confidence away from home ice. Goaltender Justin Peters, who was making his third start of the season, allowed three goals in the first period on just five shots faced. Tucson’s offense kept things tight during Peters’ shaky opening period though, registering two goals of their own. Kyle Wood buried his sixth goal of the season on an unassisted effort when he corralled a puck in the Roadrunners’ zone, weaved through oncoming traffic in the neutral zone, entered San Antonio territory and fired a wrist shot past Kent Simpson from the left circle. Christian Fischer scored the first of his trio of goals from just about the same spot Wood did, beating Simpson with a shot from the left hash marks. Kent Simpson was pulled en lieu of goaltender Jeremy Smith to begin the second. Smith was stalwart in his first 10 minutes of relief of Simpson, turning away 10 Roadrunners shots, but Dakota Mermis got a puck past San Antonio’s netminder when his slap shot from the high slot ricochet off of Rocco Grimaldi’s stick and into the back of the net. The Rampage responded three minutes after Mermis’ tally and took a 4-3 lead into the third period. While killing a penalty with less than 10 minutes left to play in regulation, Laurent Dauphin hopped on a Rampage turnover in the Roadrunners zone, swung up the ice with Fischer, who upon firing the pass he received at San Antonio’s net, followed up on his own rebound to tie the game 4-4 with 8:11 left to play. 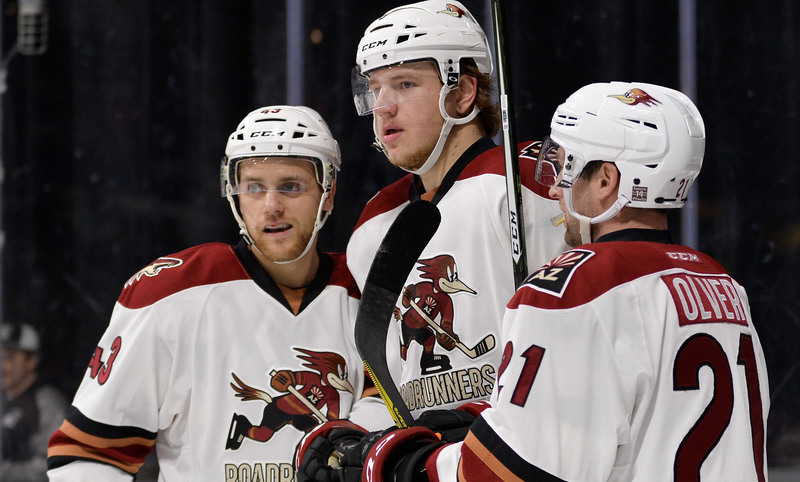 The Roadrunners entered their seventh overtime game of the season, they came into the night with a 3-3 mark in the extra frame. On the opening shift, Laurent Dauphin controlled the puck low in Tucson’s zone, feeding Zbynek Michalek with a pass behind the net. Michalek, reading the space ahead, as well as Christian Fischer’s trajectory, lofted a stretch pass for the winger to skate into. Fischer caught up with Michalek’s pass about 15 feet in front of Jeremy Smith’s net, quickly tempered control of the puck, moved it to his forehand, and beat the Rampage netminder with a shot high to the glove-side. Christian Fischer (3G) and Laurent Dauphin (3A) led all Roadrunners players in points scored (3), Christian Fischer in shots taken (7). All three of Dauphin’s assists came on Fischer’s goals. Justin Peters made 19 saves in the win. The Roadrunners will complete their back-to-back set Saturday night, when they again take on the San Antonio Rampage at the AT&T Center, where the puck is scheduled to drop just after 6:00 PM MST. 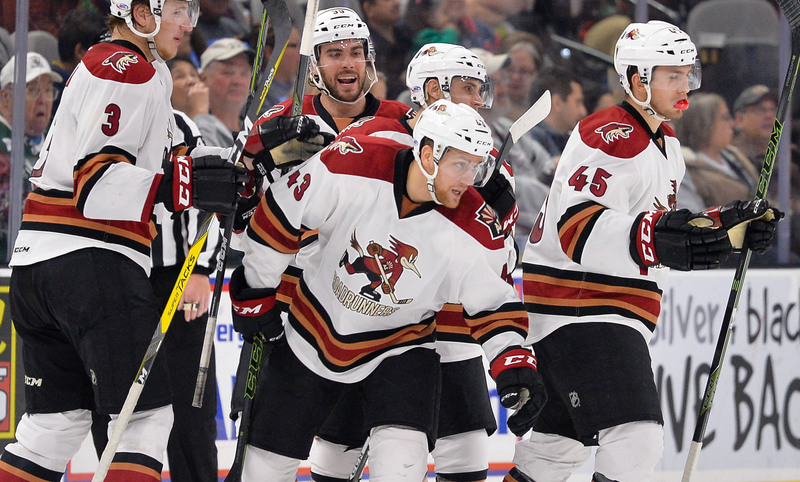 Tucson will return home following Saturday’s affair for a two-game set against the Bakersfield Condors on Tuesday and Wednesday. Both games are scheduled for 7:05 PM starts at Tucson Arena.